By now, you probably have a stack of tax forms from employers, banks, stockbrokers, lenders and more on your desk – or more likely, the kitchen counter. For some of you, those tax forms will end up in the hands of a tax professional, the rest of you will input the information on those forms, box for box, into tax preparation software – maybe with a little swearing along the way. No matter how you plan to do your taxes this year, you likely don’t know what all of the numbers, letters and other information on those forms mean. That’s about to change. This is the first in a series of posts meant help you make sense of all of those forms. The threshold for issuing a form W-2 is based on dollars – nothing else matters. Not time worked. Not position held. Just dollars, or dollar equivalents, earned. The magic number is $600. Every employer who pays at least $600 in cash or cash equivalent, including taxable benefits, must issue a form W-2. If any taxes are withheld, including those for Social Security or Medicare, a form W-2 must be issued regardless of how much was paid out to an employee. An employer prepares six copies of each form W-2 per employee. Yes, that’s a lot of paperwork. If, as the employee, you don’t want to receive paper copies and your employer has an appropriate system in place, you can opt to receive your forms electronically. To do this, you must specifically consent; your employer may not send a form W-2 electronically to any employee who doesn’t consent or who has revoked consent. 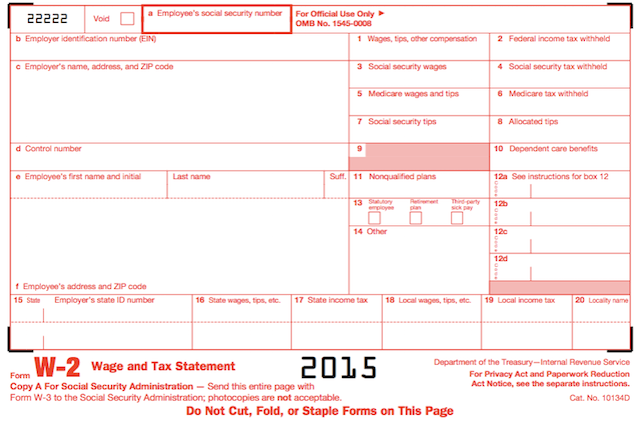 Copy A looks different from the others forms W-2 because it’s printed in red: the rest are printed in black. That’s on purpose: the printed version of the form that you buy from a supply store like Staples or print out using software from Intuit can be scanned and read by the government’s machines. The version that you can download and print out from the IRS website is not. You can be fined for using the wrong version of the form so pay attention (and don’t click and download on this version: it’s not one of the fancy, scannable ones).